Monet is a salon focused on customer service. With extensive salon training, international training in six European countries (including Rome and London), and over 17 years of experience, customer satisfaction is a must. At Monet, you will receive one-on-one attention. You will receive a consultation to determine the best treatment for you. At Monet, laser hair removal services are also offered in the comfort of a boutique setting. Diana is a certified laser technician, with certification training from the National Laser Institute. 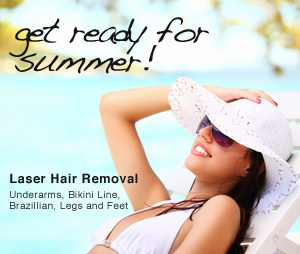 Under the medical direction of Dr. Mindell, Diana offers laser hair removal services for the entire body. Diana uses the Palomar Starlux 300 IPL. It is very comfortable to receive treatments with this machine. Available for skin types 1-4. When assessing a laser treatment plan, Fitzpatrick skin typing, your bodies hair color/texture, medications, and sun exposure will all be analyzed in order to achieve the desired treatment plan best for you. at Monet we've got you covered from Head to Toe.